I always think there’s a bit of an irony in the volunteer work that I do for the local Wildlife Trust and the Biological Records Centre. I am surrounded by people with great expertise, sometimes in very specialised fields, sometimes across an amazing range, and whilst I think I have a reasonable lay knowledge of the natural world,and know a fair bit about mammals and reptiles, I realise it’s still quite limited and I remain absolutely appalling at identification of bird, plant and insect/bug life, though I am slowly assimilating snippets of new knowledge. I was never any good at the shoot-em-up aerial warfare computer games my husband loves,and am more than likely to ensure that passing pilots on my side are the victim of friendly fire – for the same reasons that I can’t tell my buzzard silhouettes from my red kites. Or at least, I can, with the book there, but I can’t retain the information. I tease my husband for his rather minimal plant classification system (tree-plants, flower-plants…) but in all honesty, am not much better myself, particularly when it comes to tree-plants – sorry, trees! The bad pun in the title is not quite accurate, though, in that I can at least tell elder when it has flowers or berries, but that’s about the limit of my arboreal expertise. Having said that, two or three small successes and pleasures have accrued today and yesterday. I took a phone call at the records office and though the memory failed to dredge up the name of the caterpillar I’d been looking up last week for someone else, I could at least find it quickly again and tell the lady that the rather hefty, hairy but pretty critter she’d found was a Pale Tussock moth larva. It isn’t really a great feat as it’s a fairly distinctive chap with its toothbrush tufts and the perky red tailpiece, but I was pleased with this small success nonetheless! 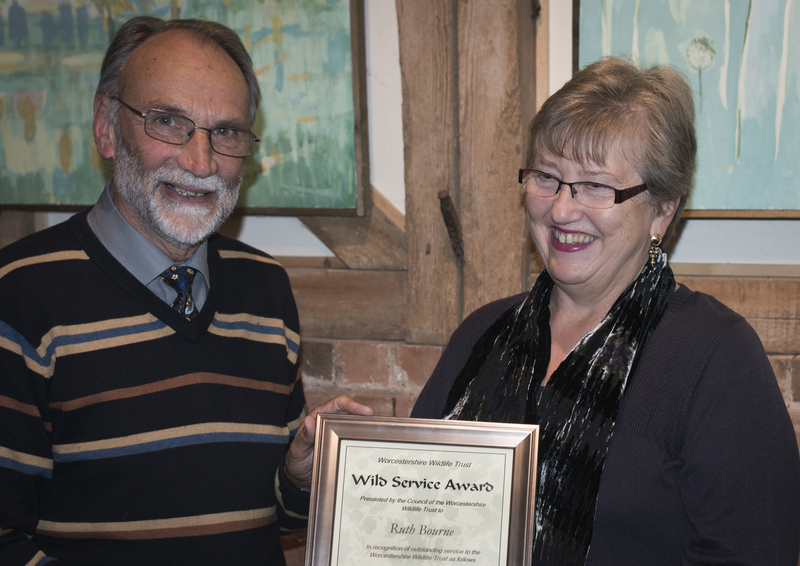 The other pleasure was at a meeting of the Trust last night, when a number of volunteers were presented with “Wild Service Awards” in recognition of their work, in many cases over decades, and often involving the sort of expertise and experience I referred to above. I was surprised and pleased to receive one for the rather different sort of work that I do, currently updating parts of the website, helping out with some online tasks, taking stock photos and previously helping with office work. I’ve always been more a backstage person by inclination and find this sort of thing a bit embarrassing, but have finally decided ‘what the heck; just enjoy it’ and accept gratefully in the spirit intended. It was a pleasure to have efforts acknowledged and a privilege to be included among all those experts! The evening ended with a talk by Mike Averill, recipient of the Worcestershire Wildlife Medal for his conservation work over many years.He is undoubtedly the Dragonfly king, but his talk “Water for Life” took a rather different slant with only a few dragon-y detours, and was an excellent and thought-provoking end to the day. This entry was posted in Journal, Nature, People and tagged Wildlife, Worcestershire Wildlife Trust. Bookmark the permalink. Congratulations on the award! Even “backstage” work for an organization such as this one would be rewarding to me. I too, am just now starting to learn bird and tree identification and I love every minute of it.